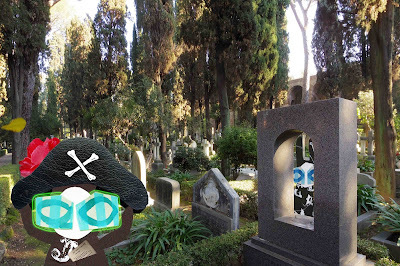 Wabsworth watched the Wabbit materialise in the cemetery. The full code notebook was tucked into his fur and, on his head, Jenny's pirate hat took the show. Wabsworth was the Wabbit's android double so he knew pretty much all there was to know about the Wabbit. So he spoke quietly. "What can you see, Commander?" The Wabbit's gaze couldn't let the object go but he managed a shrug. "Perfection." Wabsworth waited some time. He watched a leaf glide lazily past the Wabbit's head and heard him suddenly speak. "This is your dream, isn't it, Wabsworth?" Wabsworth nodded and shuffled his feet. The Wabbit stared again because he could see everything that had ever been and everything that was to come. He smiled. "I guess what I'm seeing is real enough." Wabsworth smiled too. "The cemetery, the writers, the code, the ghosts and indeed this mission are also real." The Wabbit didn't ask why, because he didn't need to. "What about the green door?" Now Wabsworth emerged from behind the gravestone. "That's your door, not mine. What kind of door was it?" The Wabbit thought hard. "A door that looked as if it shouldn't be there." Wabsworth chortled. "That sounds like your kind of door." "The other side of the green door must be here," said the Wabbit. "I want to look for it." He removed the hat with relief. Wabsworth sighed long and hard. "I'll help you," he said, "but we won't find it." The Wabbit sat down in the sun for a nap. "It was passable so it's possible." Wabsworth heard the Wabbit snoring. It was time to hop quietly away.